Your employees will thank you for purchasing mesh office chairs. With perforated, breathable backs, these chairs ensure cool comfort on even the hottest days. 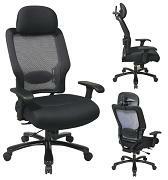 Whether you opt for ergonomic office chairs, you will find numerous options to meet your workplace priorities. Decor -- Available in multiple colors, our chairs will blend with many decors. You can also choose just the right style for your company's personality -- from traditional leather executive chairs to streamlined contemporary models. Floor Space -- For limited square footage, mesh chairs arranged on a beam efficiently accommodate multiple visitors. Chairs that stack, for easy storage, are the perfect solution for offices needing extra seating for limited periods of time. Comfort -- Ergonomic office chairs are a wise option for employees spending long periods at their desks, without a break. Look for such features as lumbar support, adjustable seat height, headrests, adjustable armrests, extra seat padding or dimensions intended for heavier or taller people. Durability -- ANSI/BIFMA certification is one sign of a structurally sound mesh office chair. Also consider stain-resistant fabrics and scratch-resistant finishes like zinc, titanium and powder-coat paint. Mobility -- Mesh office chairs equipped with rollers and swiveling seats can promote productivity, by allowing your employees freedom of movement without ever leaving their desks. Contact us to learn more ideas about selecting the right mesh office chair for your workspace. We build to your taste and shipping is always free.